Bollywood actors Anushka Sharma and Aditya Roy Kapur were spotted at Mumbai airport on Thursday (October 15). Anushka returned to the city from London, where she was shooting for Karan Johar's upcoming film, 'Ae Dil Hai Mushkil' opposite Ranbir Kapoor. Bollywood actors Anushka Sharma and Aditya Roy Kapur were spotted at Mumbai airport on Thursday (October 15). While Anushka returned to the city from London, where she was shooting for Karan Johar's upcoming film, 'Ae Dil Hai Mushkil' opposite Ranbir Kapoor, Aditya was also seen making his return. However, it is not known where the actor who will next be seen in 'Fitoor' opposite Katrina Kaif was flying back from. Anushka Sharma's airport style was comfy and smart - a striped tee shirt, ripped denims and a leather jacket with sneakers. Anushka has been making news for her romance with Virat Kohli for a while now. Anushka seemed happy to get away from the cameras. Aditya Roy Kapur was also dressed in jeans with a tee shirt and jacket. 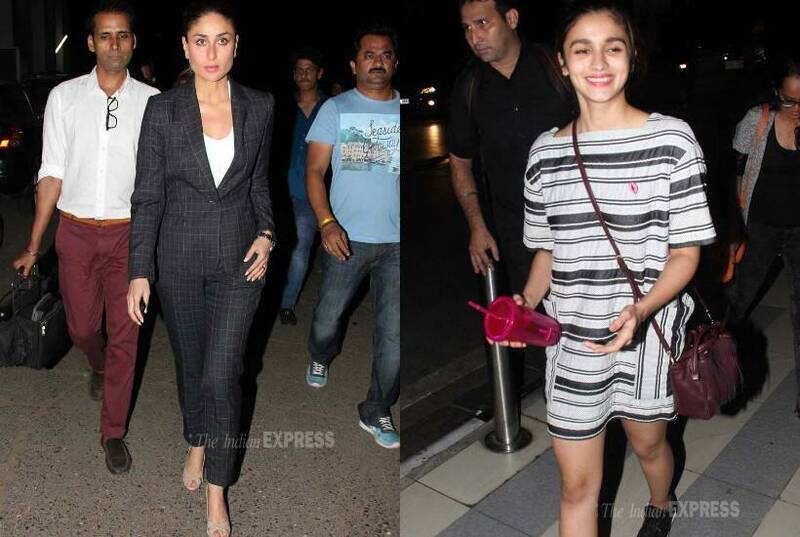 Bollywood actresses Kareena Kapoor Khan and Alia Bhatt were both impressive in their respective styles as the duo were spotted in Mumbai. However, both Alia and Kareena were not seen together and in fact each actress was accompanied by their respective co-stars - Shahid Kapoor and Arjun Kapoor. While Alia and Shahid were spotted at Mumbai airport on their way to Delhi on October 14, Kareena and Arjun were busy shooting for their upcoming film, 'Ki and Ka' in suburban Bandra on October 13. Kareena Kapoor, who plays the role of a career oriented married woman in the R. Balki film, rocked a tailored pantsuit with a white inner. Kareena Kapoor had her hair pulled back and wore neutral makeup with pink lips. Kareena's 'Ki and Ka' co-star Arjun Kapoor, who plays the supportive house husband in the film, was his usual smiling self. Meanwhile, Kareena's former flame, Shahid Kapoor was photographed at Mumbai airport. Alia and Shahid's Shaandaar releases on October 22 and the duo are now in Delhi for the final leg of their promotions. Shahid Kapoor and Alia Bhatt were leaving for Delhi where they will continue with their 'Shaandaar' film promotions. Alia was super cute in a casual dress with sneakers and a big smile. Shahid was not that camera friendly as he entered the airport grim faced.